7 Nights in a 1 Bedroom Suite at the French Quarter in Branson, Missouri! French Quarter in Branson, Missouri - Buy a 7 Night Stay in a 1 Bedroom Suite! Enjoy a 7 Night Stay at the French Quarter in Branson, Missouri! Conveniently located on the main thoroughfare in Branson, Missouri, French Quarter offers luxurious condominium comfort at an outstanding value. Steps away from live entertainment venues, restaurants and shops, the French Quarters’ modern, spacious units will make your Branson vacation even more enjoyable. Unwind from all the day’s activities by taking a dip in the pool, soaking in the hot tub, taking in a view of the Ozarks from your balcony, or enjoying a barbecue in the picnic areas. 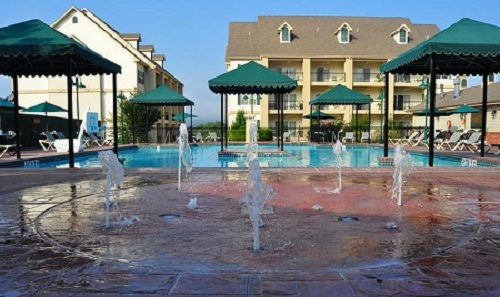 The complex also includes a children’s pool, fun splash patio, and playground. Dubbed the "Live Music Show Capital of the World," Branson, Missouri is truly a one-of-a-kind vacation destination, filled with sights and attractions for the whole family. The area boasts more than 50 live performance theaters, 3 pristine lakes, 12 championship golf courses, theme park and water park, fabulous shopping, and a wide variety of dining options. The beautiful Ozark Mountain region offers numerous choices for hiking, swimming, fishing, boating, and waterskiing in the summer. Winter brings opportunities for skiing, snowboarding, and ice skating. The city of Branson is absolutely spectacular at holiday time, offering many special shows and events showcasing an Ozarks Christmas. The French Quarter condominiums are modern, spacious, comfortable, and tastefully appointed. All units feature telephone, television, kitchen with dishwasher and garbage disposer, washer and dryer, and a balcony or patio. Some also include fireplaces. Elevator access is provided, and there are also handicapped accessible units available. Three-bedroom units have 3 or 4 baths, 1 king bed, 2 or 3 queen beds and 2 queen sofas, accommodating up to 12 people. Two-bedroom units can accommodate up to 8 people, with 2 or 3 baths, 1 king bed, 1 or 2 queen beds and 1 queen sleep sofas. A one-bedroom unit comfortably sleeps up to 4 people, with 1 bath, 1 queen bed and 1 queen sleep sofa.